The Count: 50-45... in favor of the nays. The ayes didn't even get a majority. Recriminations! Reid's now throwing around accusations of bad faith. This does not indicate to me that he has any hopes of passing the bill; he's accepted it's failed. Now he just wants to beat up on the Republicans to court the illegal voters. Thanks to Alice for the picture. Who Cried? 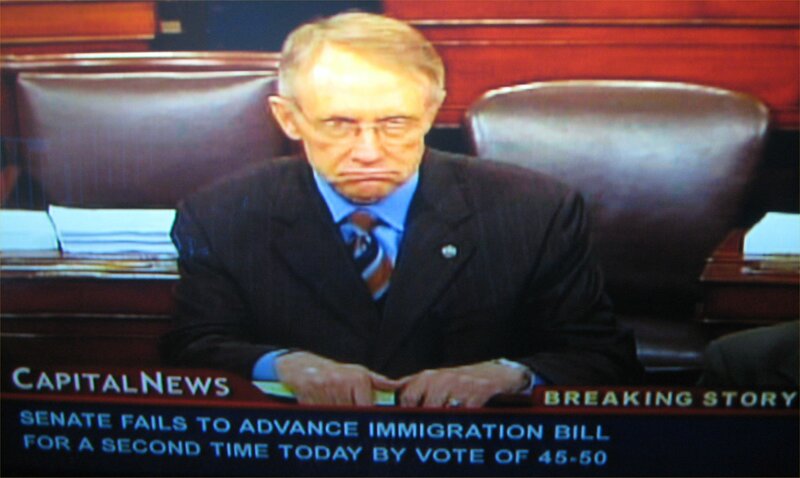 Harry Reid spoke of a colleague calling him on the phone to cry about the outcome. Michelle Malkin thinks it might be Lindsey "Tell the Bigots To Shut Up" Graham. Reid speaking now. May be announcing withdrawal of bill. Blaming Republicans for objecting to his managing of amendments. Seems like he's giving up on the comity needed to pass this, instead laying blame for defeat. Still wants to pass it over "next several weeks." Claims there's "a lot" of support for the bill outside the Senate. Acknowledges his first reaction was to be "upset." Looks like a room full of assholes milling around trying to sell insurance to each other. Hmmm... Seems like they're still counting. They may be up to 47 48 Ayes.